A sermon preached by Rev. David M. Crawford at Rundle Memorial United Church, Banff, on September 25/2011 (Pentecost 15). Part of a series of sermons of our stained glass windows. Based on Luke 15:11-32. 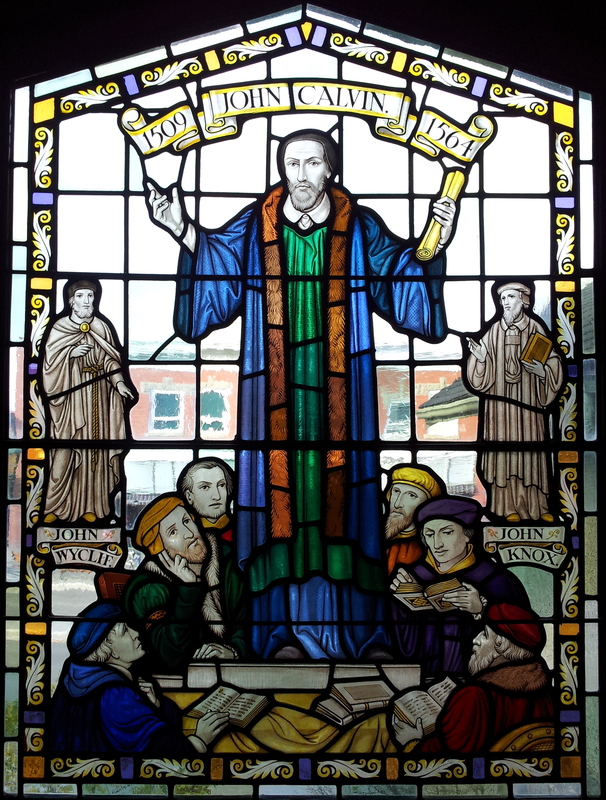 John Calvin. Take a look at the image of Calvin in our window. One Sunday this summer a visiting United Church minister was admiring our windows following worship. We chatted a bit about this particular window. He commented, “Oh, Calvin’s smiling” (actually in the portrayal it appears Calvin is scowling). This was a joke, a pretty good one for theologians, for Calvin was known as a stern and serious man. He was also know as a brilliant intellect, a systematic theologian of the highest order, and of course a leader in what became known as The Reformation. But stern, serious, cranky – yes! edition of his most famous work – The Institutes of the Christian Religion. Most Presbyterian clergy persons have this on their books shelves, in a place of honor, perhaps right next to their Bibles. Calvin spent much of his time writing, arguing, and preaching against what was widely perceived to be the corruption and erring ways of the Roman Church. He called for changes or reforms to church teaching and practice, always with the goal in mind of returning to the teaching and practice of the earliest church, as far as it could be deciphered from Jesus’ teachings, and the pastoral epistles in the New Testament (1 and 2 Timothy, Titus, 1 and 2 Peter). Here are just a few of the changes Calvin sought over the course of his mission to reform the church: the Roman Church accepted 7 sacraments. Calvin proposed only 2 – baptism and the Lord’s Supper, because that’s all he could find justification for in scripture. The Roman Church was run by what he saw as corrupt priests and bishops with far too much power, abusive and corrupted power. So Calvin looked to some of the early accounts of church organization in the New Testament where he discovered a church run by elders, in the original Koine Greek language of the New Testament, presbuteroi, or presbyters. He suggested the Church ought to be reorganized reformed, along these lines, in order to eliminate corruption, restore Jesus’ original intentions in establishing the church, and most importantly, bring the church back to the people. You see, in Calvin’s time it was common for Roman Catholic priests to celebrate Communion by themselves, on behalf of everyone else, during worship, in a little cove or corner at the front of churches, with their backs turned to the people, who never saw, touched or tasted the sacrament. They were observers of the Mass, as they were observers of the religion itself, a religion which even Catholics would agree had strayed significantly from its roots. Catholicism had become a religion experienced between God and clergy, at the exclusion of everyone else. Calvin sought to eliminate the perceived need within a corrupt church for an intermediary between God and the laity. Calvin also rejected the idea of the Pope being Christ’s prime representative on earth and claimed that there was only one King and Head of the church – Jesus Christ alone. His views proved to be widely popular yet also unpopular. He was often on the run, condemned in one region, embraced in another, ultimately spending a great deal of time in Strasbourg, then finally Geneva. To wrap up this brief history of Calvin let me say that his influence on Western culture was deep and profound. While Martin Luther often gets most of the press, historically speaking, and was indeed a far more charismatic figure, John Calvin left his mark by establishing an alternative systematic framework for the church, based in the simple idea that God’s grace revealed in Jesus Christ is meant for all people. While Luther’s legacy came to be known largely through Lutheranism, in Germany, Scandinavian countries, and eventually many different parts of the world, Calvinism took root in parts of France, the Netherlands, Scotland, South Africa, and eventually South Korea. Presbyterian or Reformed churches all belong to the family of churches founded by Calvin, and we in the United Church, with our own rich Presbyterian heritage, are also part of that family. the Prodigal Son, and in the letters of Paul. We heard one phrase from Galatians earlier which I believe captures some of the essence of this grace at the very core of our faith – “For freedom Christ has set us free!” What does that mean exactly? I had a friend at seminary who was ahead of me in studies. In response to my insistence at the time that attending worship, following the Ten Commandments, serving God were all necessary tasks for a Christian in order to know God’s love, she kept saying to me, “Church is a get-to, not a have-to”. Over and over again she’d say those words but without explanation. Eventually I got it. Grace. A bit of the depth of Grace. From a Calvinist perspective, worship is a get to not a have to, something we get to do because of God’s grace, not something we have to do to receive grace. The same holds true for all the elements of the life of faith — we seek to live the teachings of Jesus not in order that God might love us in this life and to eternity. Rather, having been touched, moved, claimed, reborn, whatever word works for you, by the grace of God in Christ, we seek to live the teachings of Jesus, forgive and reconcile, stand for justice, feed the hungry, spread the word, because we get to, as a means of praising, celebrating and thanking the God who loves us like that prodigal’s father, whose grace has already saved, changed, and freed us! For freedom Christ has set us free! Can we think of church as a get-to, not a have-to? Can we embrace our spiritual life as an opportunity, not a requirement? Can we perceive of grace as gifting us first and then leading us into discipleship? To glorify and enjoy God forever? For freedom Christ has set us free?